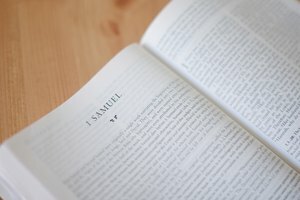 What Does the Bible Say About Teaching Children? Many people wonder what the Bible has to say about teaching children. The Bible instructs God's people to teach children about God's laws. 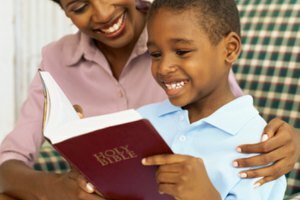 If people take the time to train their children about God's ways, children will not turn from that instruction later in life. Jesus valued children, and Paul provided additional support for teaching children about God in his writings in the New Testament. In the book of Deuteronomy, the Bible instructs parents to teach their children about the ways of God. In Deuteronomy 4:9, the Bible tells God's people to teach God's laws "to your children and to their children after them." Deuteronomy 4:10 goes on to instruct the Israelites to assemble so they "may learn to revere (God) as long as they live in the land and may teach (God's laws) to their children." Jesus valued children and found them to be important in a society that did not value them. In Mark 10:13-16, the Bible records the time that the disciples did not want to let the little children touch Jesus. Jesus "rebuked" his disciples and invited the children to come to him. The Bible includes additional New Testament support for teaching the children in Ephesians 6:4: "Fathers, do not exasperate your children; instead, bring them up in the training and instruction of the Lord." The Bible defines the type of teaching for the children to be all-encompassing. In Deuteronomy 11:19, the Bible says to teach children about God's laws in numerous ways, such as talking about God's laws "when you sit at home and when you walk along the road, when you lie down and when you get up." In Deuteronomy 11:20, the Bible even says to write God's laws "on the doorframes of your houses and on your gates." Many who practice Judaism take the instructions in Deuteronomy 11:19-20 literally. They even affix a mezuzah to the door frame that contains parchment inscribed with Hebrew verses. Most Christians do not interpret this passage to mean that Bible verses need to be inscribed by the front door. Instead, they read these verses as God's instruction to teach children about his ways and to take this instruction seriously. God expects parents (and other adults in a child's life) to teach their children about God on a regular basis. Teaching a child about God can result in a lifelong relationship between the child and God. In Proverbs 22:6, the Bible says, "Train a child in the way he should go, and when he is old he will not turn from it." Training a child involves multiple lessons in which a person teaches a child all about God. 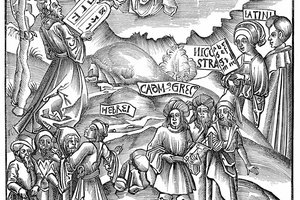 How Did Jesus Depart From the Jews' Traditions? Writer, Contributing. "What Does the Bible Say About Teaching Children?" Synonym, https://classroom.synonym.com/what-does-the-bible-say-about-teaching-children-12078418.html. 29 September 2017.